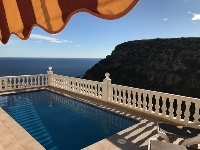 VILLAS AND APARTMENTS TO RENT IN MORAIRA, SPAIN. 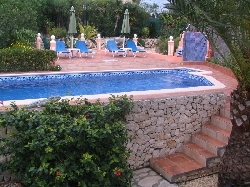 Welcome to our selection of holiday homes to rent in Moraira, Spain. Moraira is a town just a short distance south of Javea on the Costa Blanca. Formerly a small fishing village with stunning views across to the rock of Calpe, it now survives from tourism whilst retaining much of the charm which has long attracted visitors. Moraira has a number of beautiful beaches to choose from, the closest being "Platja de l'Ampolla" another option is "Platja del Portet" with its golden sand, turquoise waters and a few little cafe bars overlooking the beach, it is a great place to relax and soak up the sun. Looking for self catering holiday accommodation in Moraira? Then below is a selection of apartments in Moraira and villas in Moraira that can be rented direct from their owners. You can either click on each listing for further details or you can use our search engine on the left if you are looking for something in particular.